When Corel took stock of Corel Painter, the perennial go-to app for digital artistry, the company decided that for the 2019 version, it would concentrate not on flashy headlining new features, but on enhancing app interface and performance. 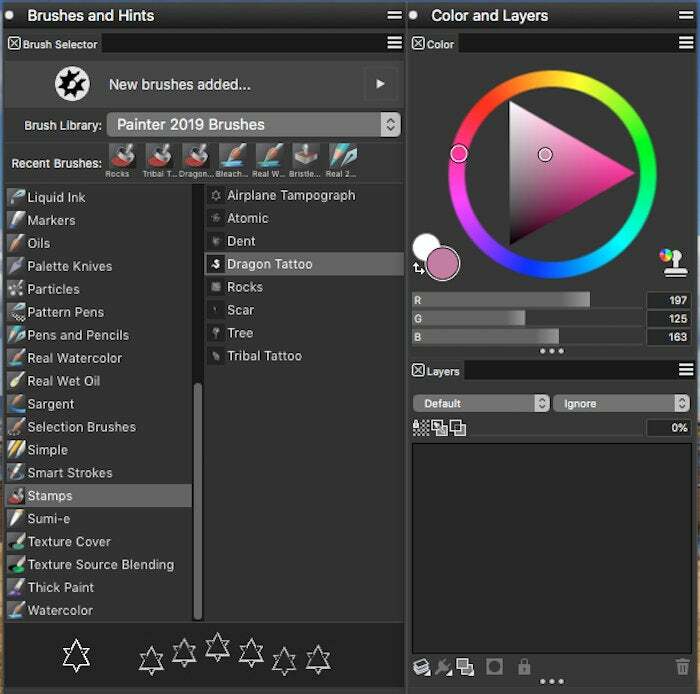 The new Painter now joins other visual creation and effects software by implementing a dark interface and pairing that with a complete app design overhaul. Painter 2019 also delivers speed boosts and features that simplify and amplify creative workflows. Oh, and there are 36 new brushes and a new brush category. Compared with last year’s upgrade, which showcased complex new brush and texture technologies, Corel’s aim with Painter 2019 is more modest, but still solid. Corel has redesigned some 650 app icons with a fresh dark interface, as compared with previous versions. Painter has revamped its entire interface from top to bottom with more than 650 redesigned icons and controls to accompany its dark theme. It is lovely; the new icons are large, clear, and easier to decipher compared with the previous version, where they had begun to look tired, old fashioned, and less friendly. As you choose a tool, it is clearly highlighted, making it easy to track your tasks. 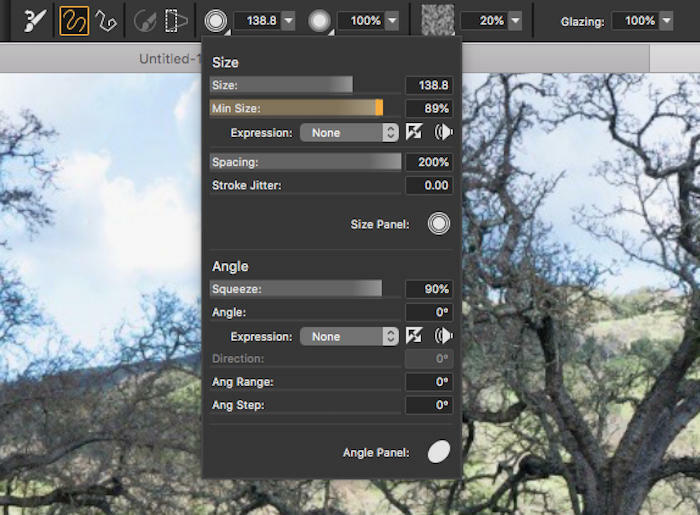 Round icons offer options for shaping brushes; square icons offer access to media settings. Backgrounds for palettes, windows, and screens are now dark gray to better isolate colors. In total, three gray themes are available, including the original light gray that many users still like, and a middle gray. 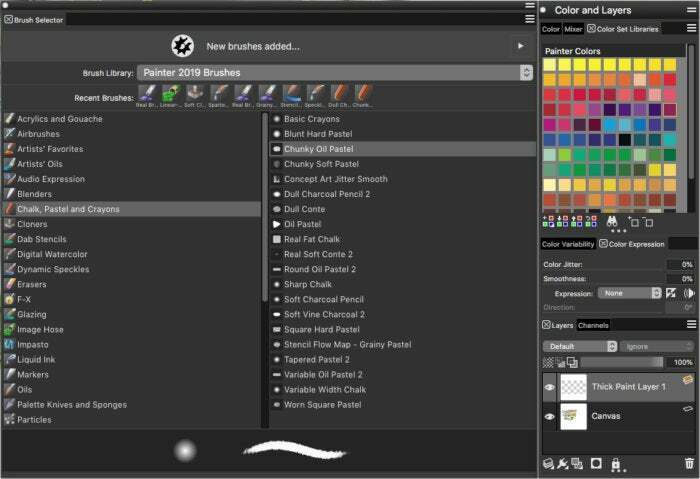 Painter 2019 debuts a new look for windows and menus, with little round grabbers in the color wheel set on a neutral gray background. Painter 2019 features an updated, larger slider bar, complete with a handy little grabber, which makes controls a lot easier to handle. Holding down the Command key while dragging invokes a precision mode that moves the slider slowly and in teensy increments. Bigger, better sliders with grabby ends make adjustments easier. You can customize the size of the floating color selector and use the pin to position it anywhere you want on your canvas. With Painter 2019, Corel has overhauled its color workflow. New circular grabbers in the Color Wheel make it easier to see and set colors. Similar grabbers also appear in the floating Temporal Colors Selector, which you can conveniently pin on your canvas for easier hand-eye reference. The floating color selector is easy to resize, move, and toggle on or off. 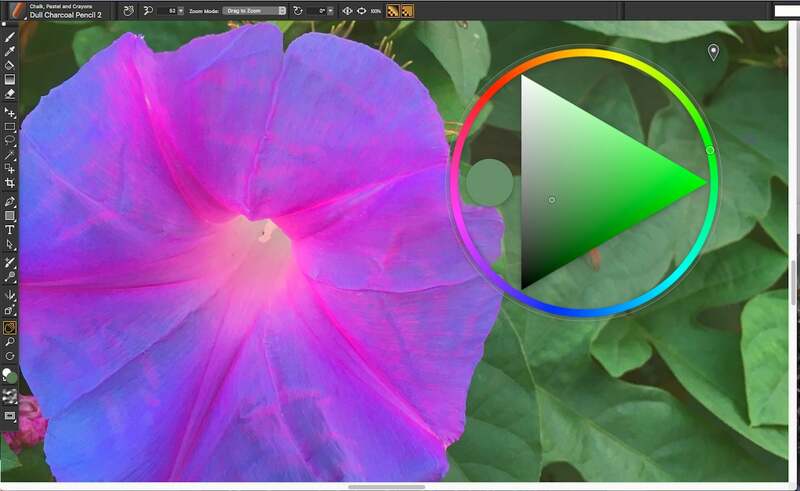 In addition to updating the interface, the new Painter version concentrates on boosting performance. Those improvements will be most obvious for artists working on high-resolution, multi-layered canvases and using large brushes. Corel says performance is 50 percent faster than the previous version for zoom, pan, and rotate. If you’re using an older computer, you may or may not benefit from the improved performance, but you can still optimize the app in the preferences by setting a separate scratch disk, lowering the number of undos, using up to 80 percent of memory, and setting the proper number of cores. Even on my older 2013 MacBook Air, most conventional canvas operations were snappy. Features like Drag to Zoom with a Wacom pen tablet or mouse, let you move your pointer up/down or left/right to zoom in and out of your picture, offering more precision for the exact zoom level you seek. Wacom Cintiq users will benefit from improved multi-touch features for pan and zoom, though I could not test that particular feature. Despite all that extra power, the app’s startup and shutdown still seemed surprisingly sluggish. A bold new stamp brush collection debuts in Painter 2019. Brushes are the heart and soul of Corel Painter and there are several dozen new ones in the 2019 version. 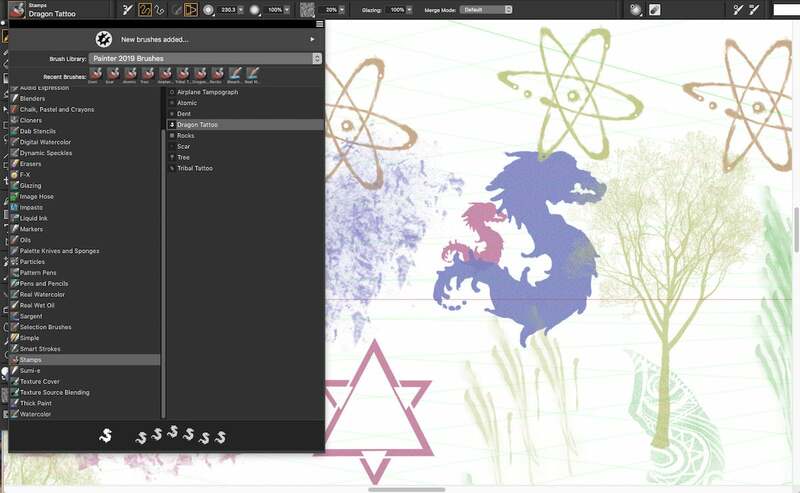 A new Stamp category–for one-click textures and shapes–debuts for the first time. They provide a convenient way for artists and designers to add depth and personality to paintings and commercial projects with shapes like trees, dragons, atomic symbols, rocks, tribal tattoos, and more. Unlike most brush strokes, stamps are generally applied with a tap of the pen or a mouse. Brushes and color picker with neutral gray background. Existing brush categories like Sargent, Selection, Thick Paint, Dab Stencils, Glazing, Airbrushes, Blenders, Impasto, Patterned Pens, Real Watercolor, and Real Wet Oil also host new brushes, while the app provides a handful of new patterns, like Fire, Moss, Hazard, and more. Painter’s Enhanced Brush Ghost, which displays the brush diameter on canvas, lets you accurately track the size of your strokes. At first displaying an outline of the brush diameter, it turns into an icon as you start to paint, letting you track the exact location of your mouse or pen. You can now customize the icon by shape, color, and angle. While the enhanced version is the default setting in Painter 2019, you can still use the original brush ghost that emulates the size, shape, and rotation of your brush stroke, if you prefer. 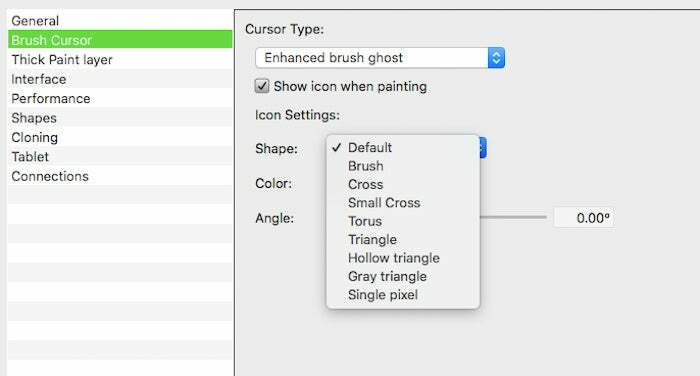 The enhanced brush ghost feature offers additional brush cursor options. I love the new Painter 2019 upgrade, and highly recommend it if you are running older versions of the software, are a newcomer, or work with high-end systems and large canvases. With a relative lack of headlining new features, Painter 2019 may seem more like an update than an upgrade, and may disappoint users expecting more in the way of cool new brush tech. But if performance or usability are issues for your workflow, the new version will likely be worth the price to ease the creation process. If you already have and are happy with Painter 2018, you could easily skip this new version.